THIS PROGRAM IS DESIGNED TO INCRE﻿ASE STU﻿DENTS' LOVE AND APPRECIATION OF VISUAL ARTS. 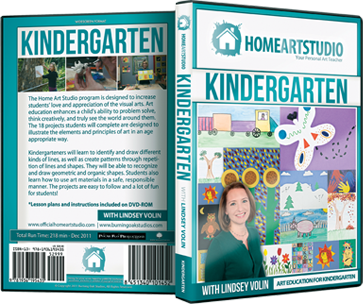 The Home Art Studio program will enhance a child’s ability to problem-solve, think creatively, and truly see the world around them. The art projects students will complete are designed to illustrate the elements and principles of art in an age-appropriate way. Students will work at different paces. Please let them go at their own speed to express themselves, while also taking the time to make sure they absorb the concepts being taught in the lesson. Most importantly, keep “art time” pressure-free and encourage your student to think outside the canvas; students are most creative when they’re having fun! We recommend viewing and beginning one project a week. The lessons build on prior knowledge. Throughout the school year, the student will gain greater understanding and hands-on skills. The lessons include a variety of media. Students are introduced to drawing, painting, sculpture, and more! Students will also listen to professional artists, take a trip to an art museum, and learn about how art is everywhere in the world around them. Parents don’t need to be intimidated by their own lack of knowledge or skill as an artist. The projects are easy to follow, and a lot of fun for students! Do you have more questions?